An interview with the Australian Broadcasting Corporation. (Note: They confuse Maher Assad with his late Majd below. Majd has passed away of a drug over doze two years ago. In the audio interview I clearly say Maher). MARK COLVIN: Well you heard Mr Rudd outline some of the background there about a country where the Ba’ath Party dictatorship has lasted for over 40 years. President Hafez al-Assad ruled over the country for most of that time, and in 1982 faced with an uprising in the town of Hama, he ordered one of the bloodiest crackdowns in the modern history of the Middle East. It may be one reason why Syrians have been slow to rise up. But after an attack on protesters in the town of Daraa this week, that’s expected to change later tonight; Friday, Syrian time. The President, Hafez al-Assad’s son Bashar, has made big promises, including dropping the restrictive 48-year-old emergency law. But that’s unlikely to be enough for the many who are expected to protest tonight. And the fast changing situation has emboldened exiled democrats like Ammar Abdulhamid. I asked him whether he wanted Bashar al-Assad and his family out of the country and if so where would they go? MARK COLVIN: But you don’t mean leave the presidency, you mean leave the country. AMMAR ABDULHAMID: Yes. Leave the country, leave the presidency of course. Because if he’s going to stay in the country, he’s going to be tried. Already blood has been spilled. Today there’s a video circulating on the web, by the way, in the last few hours. We don’t know yet the authenticity of the video but the video purports to show what happened in Saydnaya prison in 2008. That was a major massacre that took place against political prisoners in an infamous prison in Syria called Saydnaya and the video shows actually people on the ground dying and you can hear shots as people were finishing off the wounded. This happened after the army stormed into the prison. The prison was taken over for a while by the political prisoners who were rioting and demanding improvement of their living conditions inside the prison. So the army stormed on orders from Bashar al-Assad and the video is showing a person who looks very much like his brother Majd Assad. I mean everyone who saw the video is saying this is Majd al- Assad. We are trying now to find someone who really knows him very intimately because he tends to be media shy, so in order to verify whether indeed this is Majd al-Assad or not. We are right now seeing the President’s family and his Bashar and his brother himself being under a microscope and that shows you that we don’t anymore care about, or are in awe of that person. To us he has now become very much a persona non grata and I would imagine that the more, even if this video is not true, it doesn’t really matter, what matters is that we don’t worry anymore about raising discussions openly about how corrupt they are, how involved they are in bloodshed. MARK COLVIN: But this is roughly what the Libyan opposition was saying a few weeks ago; is that lack of ability to compromise not likely to bring on a civil war as in Libya? MARK COLVIN: Well Mubarak still hasn’t left the country. MARK COLVIN: But that was precisely why I was asking you whether it was enough for him to leave the presidency or whether you were uncompromising about him leaving the country? AMMAR ABDULHAMID: Well let me leave that to the Syrian people. I’m only one person, I very much want to see personally Bashar being held responsible for a variety of issues but at the same time I cannot really sort of just take my own personal opinion and impose it upon the Syrian people. The Syrian people might be willing to see that kind of a compromise where he resigns and simply retires; that is a possibility. So I will not take it off the table because it’s not really up to me to make that decision and speak on behalf of the people and the opposition and so on. This is an issue that you will have to deal with in due course of time and I would imagine very soon but for now, I think what we need to demand and to make sure that the message is, that has to reach out to people inside Syria and outside Syria that this system has lost all legitimacy and that only a major change can convince us and that Bashar Assad, we’ve tried him for 12 years or close to 12 years and he really didn’t deliver on the promises of reform. Now we need new faces, so he has to leave. One way or another, he has to leave; we need a new system, we need a new government, we need new faces in charge, we cannot put up with the promises and lies of the al-Assad regime. MARK COLVIN: Alright well you have a revolution; there are revolutions going on all over the place at the moment but outcomes of revolutions can be bad too, you can get military coups, you can get dissent into anarchy, you can get fundamentalists taking over; are you optimistic about Syria? 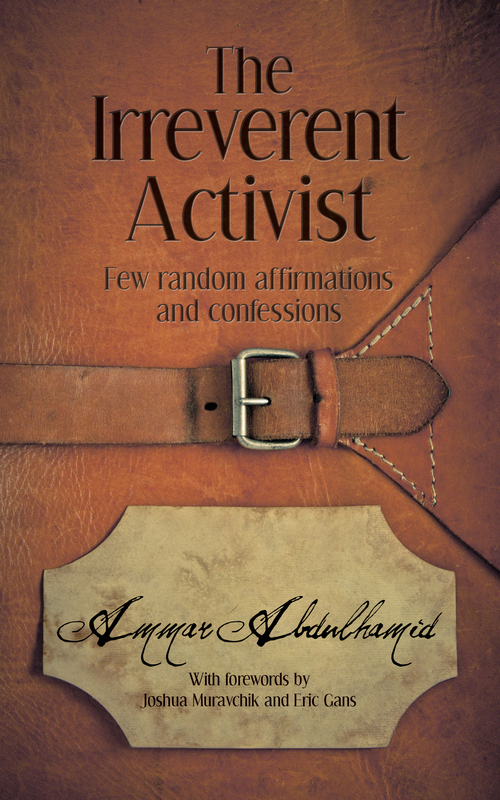 AMMAR ABDULHAMID: Well I am guardedly optimistic of course but all of us realise that when it comes down to these kind of changes, definitely there are a lot of negative possibilities and potentialities out there. We did not make the decision for revolution lightly. I mean for a long time in fact people were wondering whether Syrians are alive or not, because we’ve been so patient; because of the experience of Hama we really wanted to avoid this kind confrontation as much as possible but frankly we cannot take it anymore. Right now we’re willing to risk and we’re willing to face the negative as well as positive potentialities. We are hoping for the best, we are trying as much as possible to send the right messages to all difference segments of society, to some Ba’ath party leadership, to some army leadership that we are willing to work with you to build something new. We are not going to seek to take revenge against everything or open every file of corruption that’s plagued the country. We’re willing to make a fresh new start but you have to be willing also to work with us and meet us half way. MARK COLVIN: Ammar Abdulhamid the founder and director of the Tharwa Foundation, a leading Syrian human rights and pro-democracy organisation. Posted on 25/03/2011 25/05/2016 by AmmarPosted in Activism & Advocacy, Democracy & Human Rights, Interviews, Nonviolence, Syrian PoliticsTagged Democratization, The Assad Regime.